It's an unusual family - a pair of bald eagles have taken a baby red-tailed hawk into their nest and raised it alongside their own three chicks. The eagles' nest is located at the Shoal Harbour Migratory Bird Sanctuary off the coast of British Columbia. The two species are typically "mortal enemies", according to a local wildlife foundation. 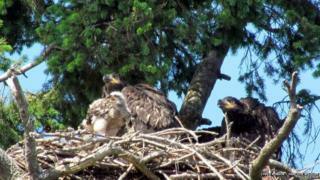 Although the mixed brood is one big happy family for now, experts warn the hawk may not survive. "The fact that it survived so long is absolutely amazing," raptor specialist David Bird told the Vancouver Sun. "The big question is - will it survive the next week to get out of the nest?" Dr Bird, who is the director of the Hancock Wildlife Foundation Director, believes the baby bird was taken by a marauding eagle from its own nest as feed for the young family. Once it got there, it opened its beak and begged for food, not knowing what fate awaited it, Dr Bird suggested. That's when the eagles' parental instinct must have kicked in, he said. While the hawk may have been taken in as part of the brood, that doesn't mean everyone is all "lovey-dovey", wrote eagle biologist David Hancock on the foundation's website. "Sibling rivalry and fratricide is not uncommon in eagles," he wrote. But red-tailed hawks, while just about a quarter of the size of a bald eagle, are known to be aggressive and capable of defending themselves against eagle attacks, he said. Part of what makes this nest so extraordinary is its location, he wrote. Located near Sidney, British Columbia, it is surrounded by homes, dog-walkers and bird-watchers. "These are very successful urban eagles!" Mr Hancock wrote.